Marketing is a field that is not in my wheelhouse. Oh, I can sell you something you may need in order to live a normal life, or to just to continue living. Nurses do that. But, when it comes to marketing a companies image I am clueless, unless that marketing is based on common sense, then I may be able to offer something. CVS Pharmacies is a massive company. They have on their payroll a whole bunch of pharmacists, but a whole lot more marketing, and PR people. They have to. They want to be the best, and the biggest pharmacy in the United States. Currently, they are number two after Walgreen's. CVS would like to be the pharmaceutical equivalent of Starbucks. In recent history, CVS has attempted to place a store in Sturbridge at the junction of Route 20, and Holland Road without success. Something about the construction, and eventual building would adversely affect the Quinebaug River. How it would adversely affect the river more than the ruins already on the site is beyond me. Again, not in my wheelhouse. Currently, CVS is hoping to plant itself in front of the Host Hotel, on Route 20, in the spot occupied by the Exhibition Hall. The Exhibition Hall houses Bentley's Pub. The building is one hundred and forty seven years old, and was once the main building at the Sturbridge Fairgrounds. It is in excellent condition, and is historic. CVS would prefer to have a new building on that spot after the Exhibition Hall is torn down. I don't believe the town will allow that to happen. 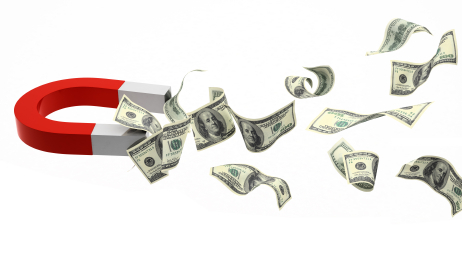 There is a process in place to determine if a building warrants saving due to its historic significance. I hope that all the town departments will act in concert to save the building when the time comes. 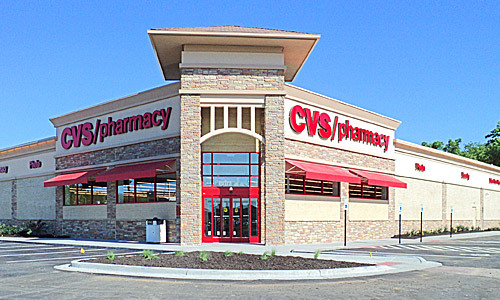 At present, CVS has asked to submit their site approval plan at a later date. This could mean that CVS is either thinking things over, or they are pulling out. We want to encourage large companies to come to Sturbridge, and all they need is a little guidance on just how to fulfill their plans for expansion without causing the communities, like us, from having a conniption when a piece of their town is threatened. What if the CVS architects took the existing building, and used it to house their new CVS store. It would be a design challenge, may cost a bit more, but it would speak very loudly not only to the town, but to all the future towns it would like to build in. Imagine CVS saving an historic building in historic Sturbridge, Massachusetts so that it may be used in a new way. The good press that would generate would be a marketing departments dream, and it may even set a precedent for future building by CVS, and other companies. The goal of building a new store is met, and is met with smiling approval of the locals. Can't thing of a thing. Just common sense. Come join FrOST for an evening bird walk with Bill Cormier from The Bird Store and more. Bring your binoculars and birding field guides. We will be looking for spring migrants and breeding birds. Take Stallion Hill Rd past OSV to Leadmine Road. The parking lot is on the left, just past the top of the hill. Your help improves our trails! Bring gloves and work shoes; tools supplied. We have a variety of tasks for all skills. NOTE: If pouring rain, the event will be postponed until Sunday, April 19th, 1 PM to 4:30 PM. If you can’t join us this month, we meet every month. Our next Trail Days will be 5/16/2015 and 6/20/2015. Check www.sturbridgetrails.org for details. Trail Day & Earth Day: Celebrate Earth Day by volunteering for our first 3rd Saturday of the month" Trail day Saturday April 18th, 8:30 am to noon. Projects include everything from spring clean up/brush trimming of 5 miles of trails, trash and litter pick up at our trail head parking lots, sustainable trail tread improvements to tree planting for wildlife habitat and discontinued trail restoration. Bring work gloves and water bottle, wear good shoes and clothes for the weather. Pizza lunch at noon. NOTE: If pouring rain in the AM event will be post-poned until Sunday, April 19th, 1 PM to 4:30 PM. Meet at the Heins Farm Trail Head, 197 Leadmine Rd. Contact treksturbridge@gmail.com if you plan on participating. The idea of having parcels of land set aside for the use of others is an idea that has been around for a very long time. Whether the land be used for the grazing of cattle, or training militia, or holding events for the common good, a central piece of land has always been important. In New England, this land for common use is of historic importance. Each town would often have a small piece of land used for common purposes located in, or near the center of the town. 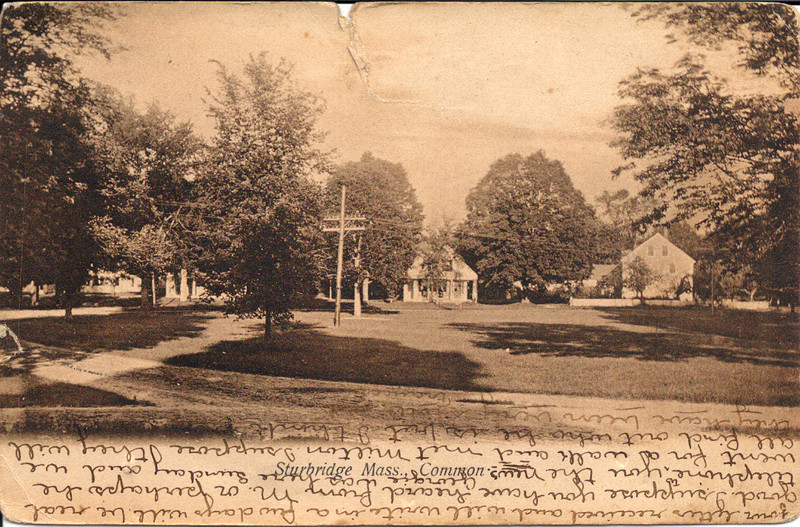 Here, in Sturbridge, a central common area was laid out in the very beginning of the towns existence. 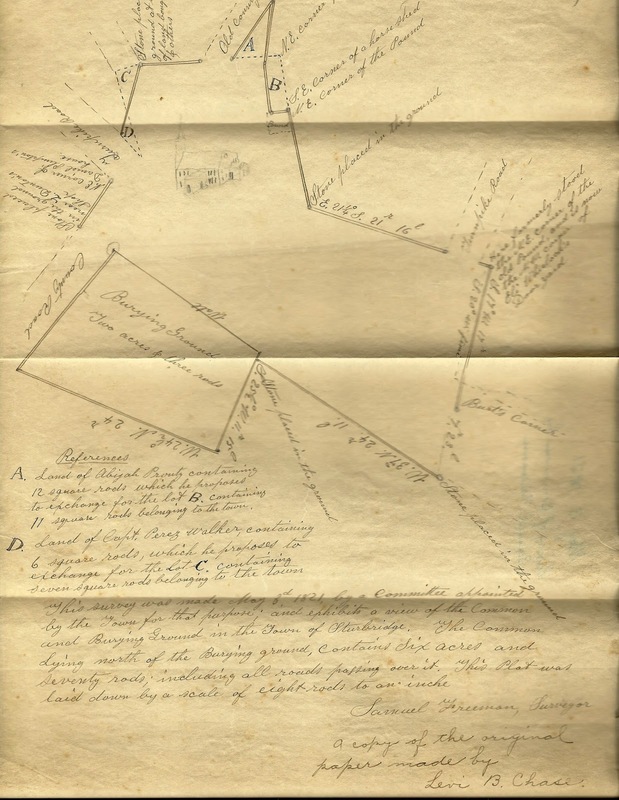 It was designed specifically for the use of the settlers of the town to use for the a central meeting place, a burying ground, and open land for training of militia, and the grazing of cattle. 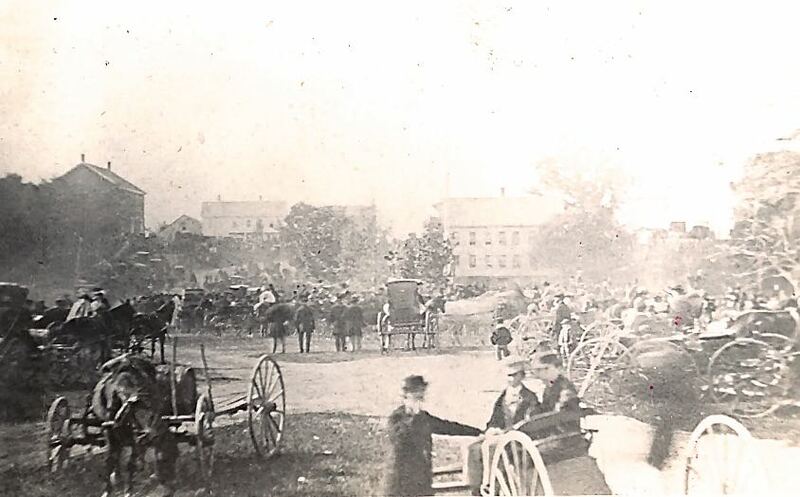 Over time, the function this common area for the towns people has shifted from agrarian, and military, the last military use of the Common was during WWII by troops stationed at the Publick House, to a central gathering place. A peaceful place for contemplation, relaxation. A spiritual place for weddings, and candlelight vigils. A social place for fairs, food festivals, and concerts. All of these activities are not only expected, but needed. What isn't needed is the stress of such activities has on the common itself. Recently, Tom Chamberland, the towns Tree Warden, warned that the trees on the common are being distressed to the point of their dying due to parking of vehicles on the grass. Parking on the grass compacts the soil, and the root system of the heritage, and other trees. As a result, they begin to fail, loose limbs, become weak, and eventually become a safety hazard, and must be removed. 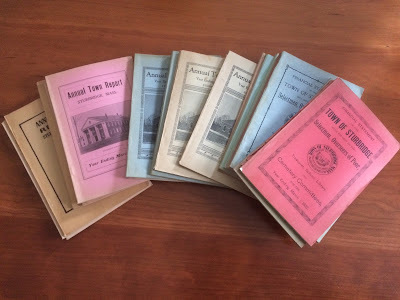 Tom has told the various Town Administrators over the years that parking on the grass for concerts, and other activities must stop, and that parking be only allowed on the pavement beside the common, and other parking areas in the vicinity, to no avail. The result has been more trees that have died, or become so stressed that they had to be removed. Last spring, two heritage trees, and one moderate growth tree were removed from the common. At this rate of removal there will be no large three to four foot in diameter trees left on the common for our children to sit under with their children. Time to change our behavior. It is time an ordinance is written prohibiting parking of any vehicle on the town common, and only allowing vehicle parking on the roadways that surround the common, with the exception of Main Street, Route 131. Parking for events can also be had behind the Town Hall, and, with permission, at the Publick House lots depending on the event. This is such a simple thing to enact, and to enforce. Common sense not only validates it, but insists on it. The cost would be for signs to be erected around the commons perimeter. A fine should be imposed, and those fines would pay for the signs. In the future, when the roads surrounding the common need to be repaved, a curbing should be part of the plan to prevent parking on the grass. We need to act before the warm weather begins, and the use of the common goes full swing. I am not going to state the obvious. After a while one becomes either immune to those kind of observations, or excessively hostile, so I will just share my thoughts. That's what I do. What the hell is happening with our weather?! Did I go to sleep in Fiskdale and wake up in Anchorage? No, because they've only received 20 inches of snow this winter. Is our weather permanently changing to this degree? It will be mid June before the snowbanks at Stop & Shop are gone. 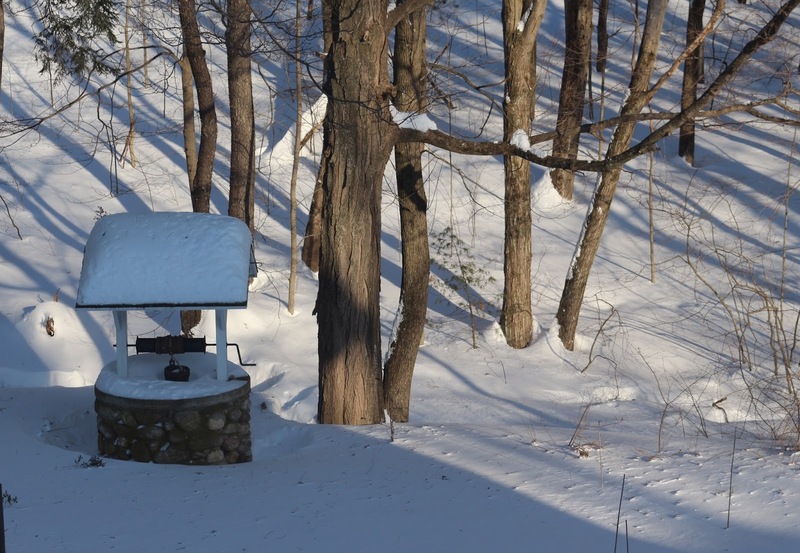 I wrote on Facebook this morning that I am thankful for much in life, and when Mary told me it was -8.7 f at 6:00 this morning I added indoor plumbing to the list. I also want to add insulated gloves, and boots, ear muffs, Thinsulate ® in any garment, a car that will start on the coldest of days, ergonomically correct snow shovels, and snow blowers. Snow blowers may not top the list, but my life has been made so much easier thanks to Arthur Sicard, the snow blowers inventor. Our driveway is not that long. Twenty feet from garage door to street, but it is double-wide, and one side runs up along the garage for another 20 feet. Still, not a massive driveway. The thing that makes our driveway a challenge is it is on Route 148, and the plow drivers take pride in keeping the road cleared from edge to edge. This means more snow berms to get through at the end of the driveway, more often. Now, the road might not be scraped to pavement like other roads in town, but it is wide. The town also doesn't like to salt the hill coming up from Route 20 causing all sorts of havoc, but the road is wide, and our snow blower lives to clear out the front of our driveway a half dozen times each storm. The mailbox is still standing. I am not complaining at all. 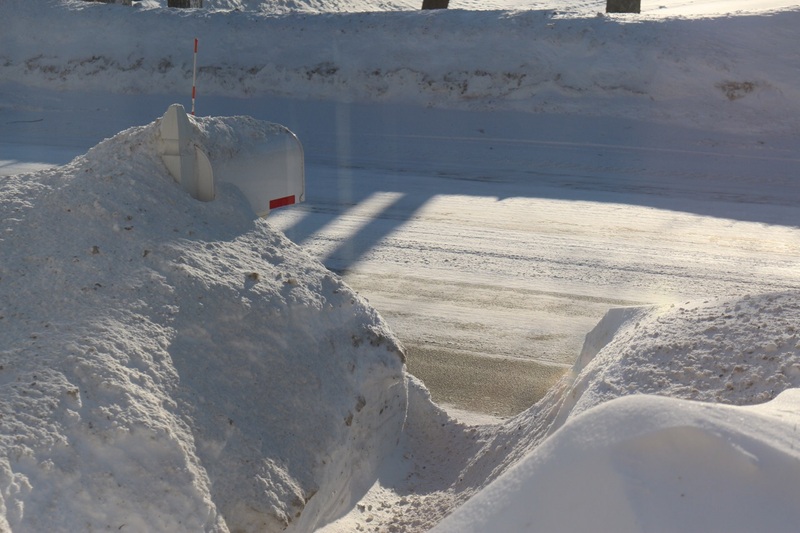 This season our mailbox has survived the plow drivers wrath. I marked the edge of our lawn with six foot orange stakes. I am sure they have helped guide the plow. This unprecedented winters snowfall has affected all of our lives in ways we could never foresee, and it is only February 16. We had the house insulated this past fall, and so far we have been a lot more comfortable. 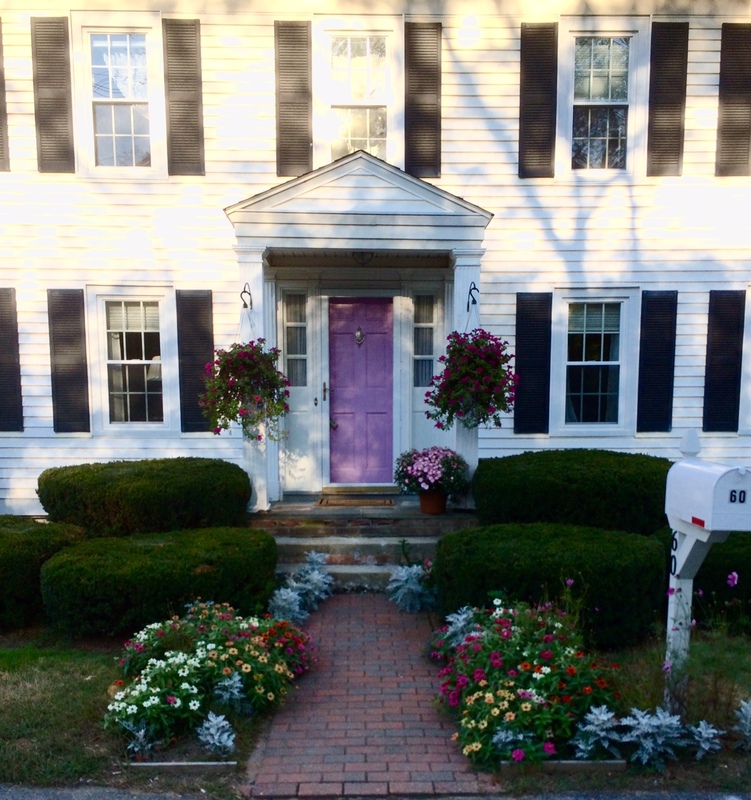 The other day I added some weather stripping strips along the front and side door. They are a bit snug, and it is like popping open a Tupperware lid to enter the house now. Which reminds me, I promised Mary I would adjust them so she won't have to throw her self at the door to get in the house again. I say the last of the snow piles will be here through April. Maybe a bit longer. The next season will depend on sump pumps, and wet vacs. A few years ago there was a proposal for a sports complex on Old Route 15, Haynes Street. The complex would have playing fields, a covered sports field, a canoe launch along the river, and facilities to support the complex. But, there were problems. One of the problems was there was not any town water or sewer in the proposed area, and that meant wells, and a vast septic system would be necessary. Seems like an obstacle worth overcoming since many places don't have town services, but apparently on this plot of land it wouldn't work, and there would be no town supplied services along Route 15. When I drive down Route 15, and see all the vacant land, I wonder what it would look like today if the complex had gone forward. Would it be built up with complimentary businesses? Would one of the top five interstate highway junctions in New England finally be fully utilized, and how would the increased business affect our town? That, we will never know. The project was scrapped, and Sturbridge went on living as a Massachusetts town from 1955 wishing it was still 1738. Cripes, the building of Walmart caused more people in town to have convulsions than a laser light show at a rave. Sturbridge has a very hard time with change. Today, there is a proposal to construct an "action sports megaplex" off Route 49 along the Charlton / Sturbridge frontier, and at this point in the approval process with the Town of Charlton, and Sturbridge, the ground is already beginning to shake. The complex is proposed to be built in five phases. The first phase would be a campground, motocross park, and a drag strip. I think that a phrase other than "drag strip" could have been used. Drag strip conjures up all sorts of images of loud, fast cars, grease and oil, the "Pink Ladies" of "Grease", enthusiastic fans, tires burning out into clouds of blue smoke, and fried foods. You know, a drag strip. 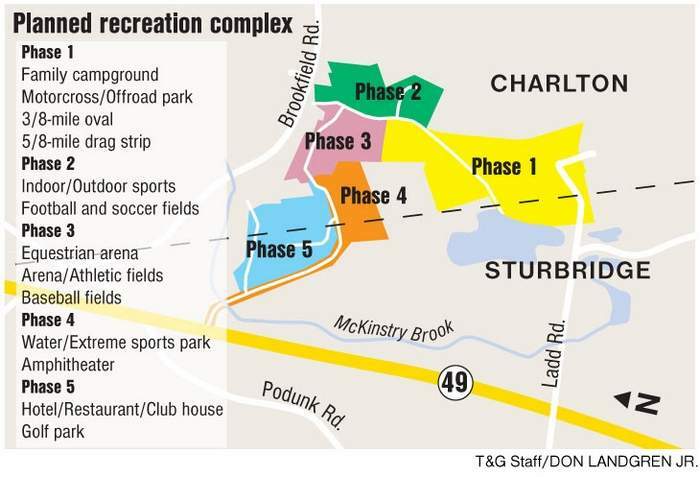 Ronald Charrette, a former Charlton selectman said, "
"This project affects the quality of life for the residents of Charlton and Sturbridge in equal measures," Ronald Charette said. "This racetrack, this motocross track, this drag strip that they are proposing affects all of our lives." The idea of a racing venue involving internal combustion engines near ones home can fluster the heck out of some folks, and may just be enough to get the citizens all riled up with their pitchforks, and torches at a Planning Board meeting. This "megaplex" is five phases, and the racing is only the first phase. In Phase two they propose football, and soccer fields. Phase three would be an equestrian arena, athletic and baseball fields. Phase four is planned to be a water/extreme sports park , and amphitheater, and finally, in Phase five, there will be places to feed, and lodge, all those people playing outside. Can't wait for the anti-horse, and water park demonstrators to show up. In the meantime, the ice skating rink on the town common is now open.